KhmerWriters.com is a new tool, provided by Danh Hong who is always providing the support for Khmer language in computing. Danh Hong was also the one who handle khmerocr.org which is now no longer maintenance and the domain is listed on sale already but this time, he comes again with another tool that will be very helpful for Khmer writers who mostly face issue such as: wrong Khmer spelling, typing without zero space (ZWSP). You can just pass the text and click on check spelling (ពិនិត្យអក្ខរាវិរុទ្ធ) then click on the next buttn for auto correction (កែដោយស្វ័យប្រវត្តិ). Of course, when you use it some words might not well detected, this require more corpus to put at his side, so hope it will be soon more accurate but at this stage, you can also use. Let's try and see, let me know in comment for your thought. Do you think is it helpful for you? If you find it's helpful, please also consider to donate to Danh Hong's team to continue his work. I just see that there is a tool by NIPTITC institute to help writing Khmer name to Latin written, it is very useful for Cambodian people to write their name in Latin characters. 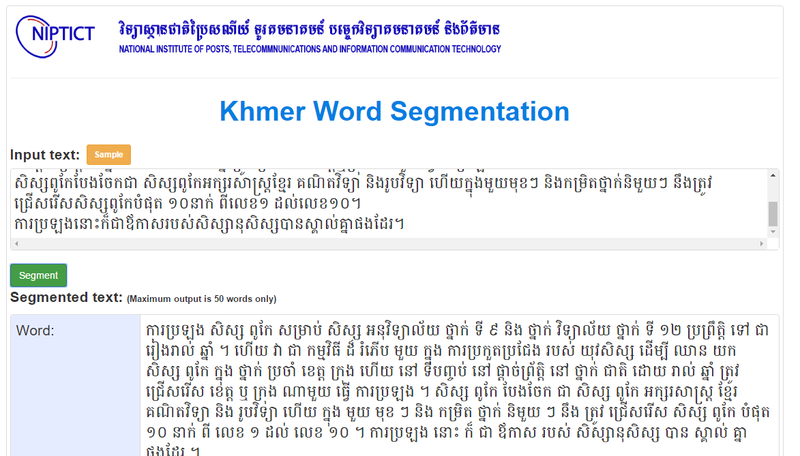 So if you are looking for the Khmer transliteration tool, I think this research r&d tool, you can try: http://rnd.niptict.edu.kh/tran/. (*) I don't really find a source of translation, I think "SMT" should stand for: Statistical Machine Translation which is in another research by this organization. How we are now about the OCR? Recently I received a contact from students asking about the Khmer OCR related researches. At the moment, it's hard to describe. I do hope students keep doing it better and professional researchers or institutes continue to giving some more detail on the topic. KhmerOCR.org, a team by Danh Hong, no more info due to no fund (sic). NIPTICT is still in progress, demo/testing of their researching work of the OCR (sic). KhmerNLP conference of last December, we have some researching papers but we don't have on OCR topic. So, if you guys who followup the topic and have other topics related to this research or product, can share to us, please give some comments. 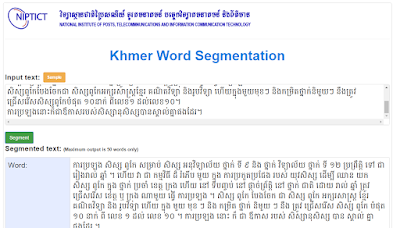 Khmer Word Segmentation is still in demand and hot topic among natural language processing topics for Khmer language. There are some methods have been introduced so far but online tool to available for people to use it are still few (my collection here). Why Word Segmentation is important? In language processing, we need to identify clearly what are the words and sentences, our Khmer language we do not have space between word, the sentence goes without many spaces that's why it is hard for machine to understand it. Segment the sentence into words nowadays we need big dictionary with method that could split each word with zero space as fast as we can. Now NIPTICT, the institute just released its first demo for their method online. This tool is very important to use in office or data entry for the website. Another online tool that I usually use is with Kheng.info so now at least we have two available online tool to use. For the explanation of the method that NIPTICT uses, I will find the update later. 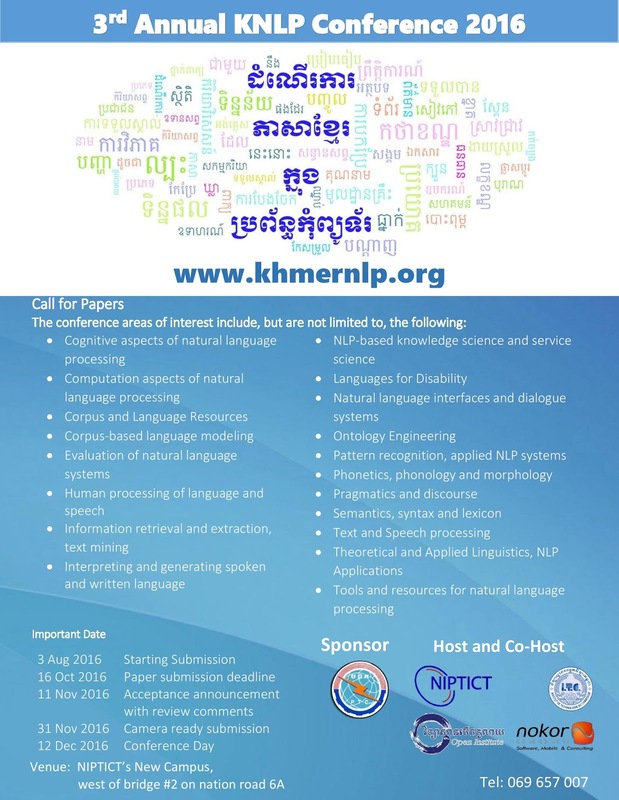 Anyway, to join the research, you can submit yours at the conference of Khmer NLP from now until mid of October. The upcoming event, Khmer Natural Language Processing Conference (Khmer NLP Conference 2016) calls for paper which is related tot he natural language processing, especially to solve problem of our Khmer language. As presented in the poster banner, there are a lot of topics that students, professional or private sector should be participating to help together solving our language issue, promoting research and encouraging more people to join solving the problem.